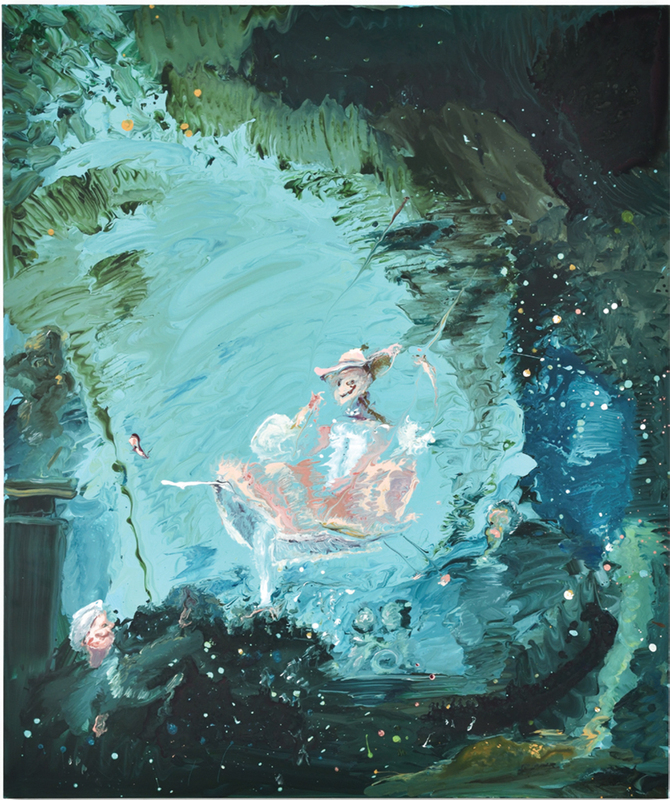 Genieve Figgis, The Happy Accidents of the Swing (after Fragonard), 2018, acrylic on canvas, 47 1/4 x 39 3/8". Genieve Figgis’s painted tableaux often seem to present a dramatic event, like an operatic performance, but one whose coordinates can’t fully be discerned. The Irish painter’s characters, who adopt theatrical poses or stand in groups, as in a conversation piece, are well aware that they are on public display. Judging by their regal costumeslong, wide dressing gowns; tuxedoes; gaiters; elaborate headgeartheir time is not our own. Moreover, they move about in spaces unlike ours. The paintings provide glimpses of frescoed ceilings, chandeliers with candles, gilded furniture with bouquets of flowers, arches and expansive windows, heavy curtains and carpets, pianos and canopy beds. On the walls hang portraits whose subjects are depicted with the same level of realism as the characters themselves. Order the PRINT EDITION of the April 2018 issue for $17 or the ONLINE EDITION for $5.99.